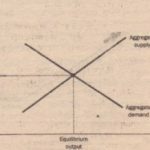 Why does a change in the price level move the quantity of goods and services demanded in the opposite direction? To answer this question, it is useful to recall that an economy’s GDP (which we denote as Y) is the sum of its consumption (C), investment (I), government purchases (G), and net exports (NX). Each of these four components contributes to the aggregate demand for goods and services. For now, we assume that government spending is fixed by policy. The other three components of spending=consumption, investment, and net exports-depend -en economic conditions and, in particular, on the price level. 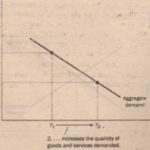 To understand the downward slope of the aggregate-demand curve, therefore, we must examine how the pricelevel affects the quantity of goods and services demanded for consumption, investment, and net exports. The Price Level and Consumption: The Wealth Effect Consider the money that you hold in your wallet and your bank. account, The nominal value of this money is fixed: One dollar is always worth one dollar. Yet the real value of a. dollar. is not fixed. Jf a candy bar costs 1 dollar, then a dollar is worth one candy bar. If the price of a candy bar falls to 50 cents, then 1 dollar is worth two candy bars. 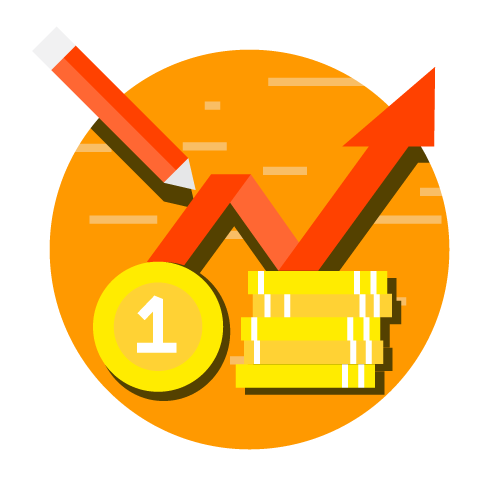 Thus, when the price level falls, the dollars you are holding rise in value, which increases your real wealth and your ability to buy goods and services. Interest rates, in turn, affect spending on. goods and services. Because a lower interest rate makes, borrowing less expensive encourages firms to borrow more to invest in new plants and equipment.It encourages households to borrow more to invest in new housing. (A lower interest rate might also stimulate consumer spending, especially large durable purchases such as cars, which are often bought on credit. 5 Thus, a lower interest rate increases the quantity of goods and services demanded. The Price and Net Exports: The Exchange-Rate Effect As we have ‘just discussed, a lower price levil in the United States lowers the US. interest rate, In response to the lower interest rate, some US. investors will seek higher returns investing abroad, For instance, as the interest rate on US. government bonds falls, a mutual fund might sell US. government bonds to buy German government bonds. As the mutual fund tries to convert its doll~s into euros to buy the German bonds, it increases the supply of dollars in the market for foreign-currency exchange. The change in relative prices affects spending, both at home and abroad. Because foreign goods are now more expensive, Americans buy less from other countries, causing U.S. imports of goods and services to decrease. At the same time, because U.S. goods are now cheaper, foreigners buy more from the United States, so U.S. exports increase. Net exports equal exports minus imports, so both of these changes cause U.S. net exports to increase. Thus, the fall in the real exchange value of the dollar leads to an increase in the quantity of goods and services demanded. This gives us a third reason the aggregate demand curve IS downward sloping. When a fall in the u.s. price level causes Us. interest rates to fall, the real value of the dollar declines in foreign exchange markets, and this depreciation stimulates US. net exports and thereby increases the quantity of goods and services demanded. Conversely, when the Us. price level rises and causes US interest rates to rise, the real value of the dollar increases, and this appreciation reduces US. 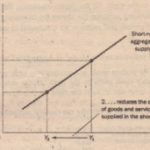 net exports and the quantity of goods and services demanded. 1. Consumers are wealthier, which stimulates the demand for consumption goods. 2. Interest rates fall, which stimulates the demand for investment goods. 3. The currency depreciates. which stimulates the demand for net exports. The same three effects work in reverse: When the level rises, decreased wealth depresses consumer spending, higher interest rates depress investment spending, and a currency appreciation depresses net exports. Here is a thought experiment to hone your intuition about these effects. 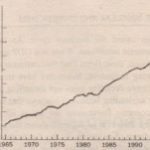 Imagine that one day you wake up and notice that, for some mysterious reason, the prices of all goods and services have fallen by half, so the dollars you are holding are worth twice as much. In real terms, you now have twice as much money as you had when you went to bed the night before. What would you do with the extra money? You could spend it at your favorite restaurant, increasing consumer spending. You could lend it out (by buying a bond or depositing it in your bank), reducing interest rates and increasing investment spending. Or you could invest it overseas (by buying shares in an international mutual fund), reducing the real exchange value of the dollar and increasing net exports. 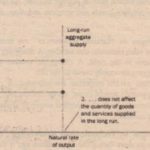 Whichever of these three responses you choose, the fall in the price: level leads to an increase in the quantity of goods and ·services demanded. This is what the downward slope of the aggregate-demand curve represents.